Over the years, we have promoted a wide range of semi-classical and classical works of Italian composers, original shows and musical groups on tour from Italy. We have an extensive music collection available at the Italian Cultural Center. Our choral group, Coro Allegro, is for anyone who enjoys singing and wants to learn traditional Italian folk and popular songs. 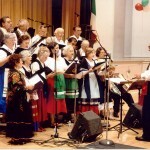 Since 1985, Coro has performed at NBICF special events, such as Festa Italiana, and at numerous concerts and Italian festivals throughout Northern California. 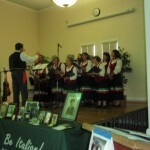 Coro rehearses at the Italian Cultural Center and encourages new members to join our group. Coro Allegro is accepting new singers. Additional voices – sopranos, altos, tenors, and baritone/bass will make it possible to expand the Coro’s programs. We are also looking for individuals who can play an instrument to accompany the Coro. We would like to find a keyboard, guitar, bass, percussion, sax or other instruments. Full knowledge of the Italian language, although useful, is not necessary. 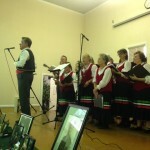 Click here to listen to Coro performing Amore scusami at the Father’s Day Dinner. The Director of Coro Allegro is Les Villanyi. The Coro meets on Tuesday evenings at the Center. If you have an interest in joining or learning more about the Coro, call Les at 707-484-4992 or send an email to coroallegro.nbicf@gmail.com.